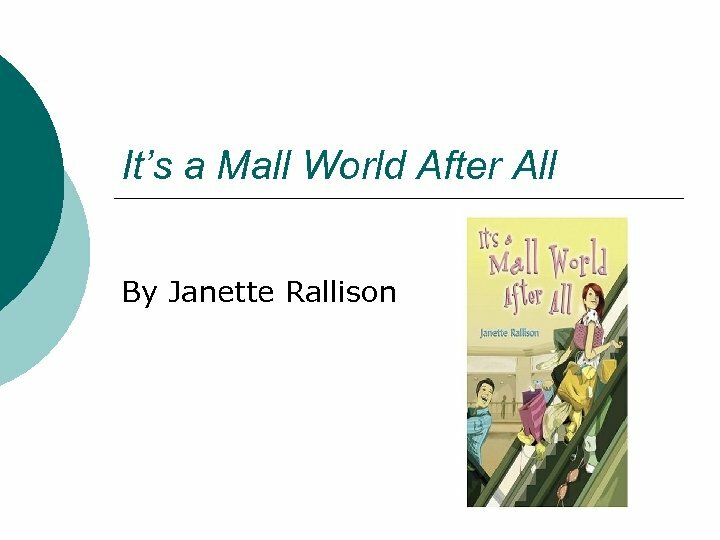 It’s a Mall World After All--Summary Charlotte is a senior in high school, who is working as a perfume lady in Bloomingdale’s to make some extra money for the holidays. While spraying unsuspecting customers, Charlotte sees Bryant, her best friend Brianna’s boyfriend, flirting with a girl from another school. Charlotte is shocked. She keeps her eye on Bryant and the mystery girl as they walk through the mall, by moving from one Bloomingdale’s entrance to another, to be sure of what she is seeing. While Charlotte is stalking Bryant, she sees a young boy trying to steal a pair of shoes. She shifts her attention from Bryant to the boy to stop him from stealing. Through their conversation, she finds out that the boy is stealing the shoes because his mom works as a waitress and can’t afford to buy good work shoes, so she is always in pain after her shift. Her heart goes out the little boy and she offers to buy the shoes for him if he cleans up all the trash he sees in the mall. Charlotte knows she has to tell Brianna about Bryant’s cheating, well at least his flirting. To Charlotte’s shock, the next day at school, Brianna is mad at her! Bryant accuses Charlotte of trying to break them up and Brianna believes him over her. 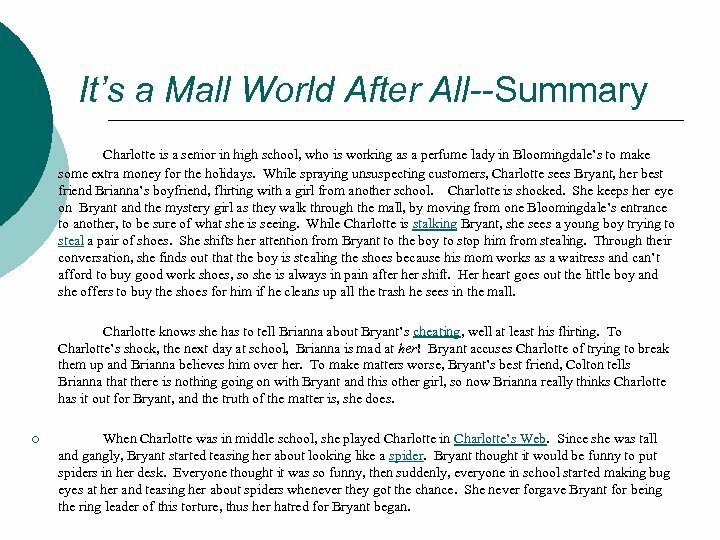 To make matters worse, Bryant’s best friend, Colton tells Brianna that there is nothing going on with Bryant and this other girl, so now Brianna really thinks Charlotte has it out for Bryant, and the truth of the matter is, she does. ¡ When Charlotte was in middle school, she played Charlotte in Charlotte’s Web. Since she was tall and gangly, Bryant started teasing her about looking like a spider. Bryant thought it would be funny to put spiders in her desk. Everyone thought it was so funny, then suddenly, everyone in school started making bug eyes at her and teasing her about spiders whenever they got the chance. She never forgave Bryant for being the ring leader of this torture, thus her hatred for Bryant began. 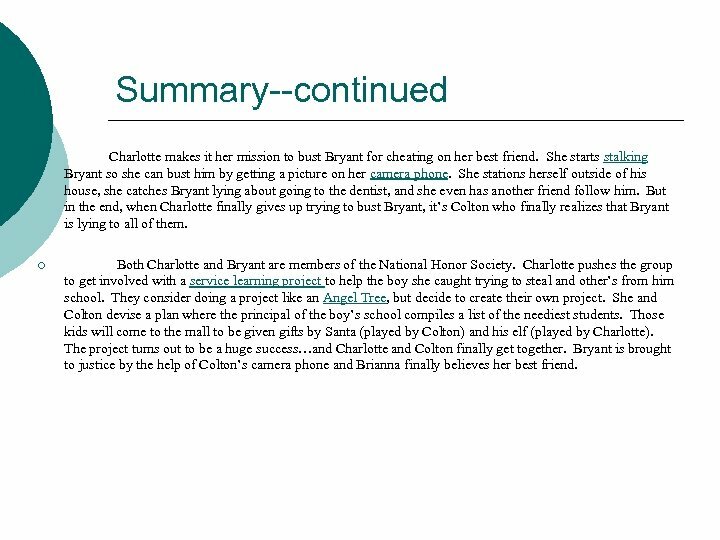 Summary--continued ¡ Charlotte makes it her mission to bust Bryant for cheating on her best friend. She starts stalking Bryant so she can bust him by getting a picture on her camera phone. She stations herself outside of his house, she catches Bryant lying about going to the dentist, and she even has another friend follow him. But in the end, when Charlotte finally gives up trying to bust Bryant, it’s Colton who finally realizes that Bryant is lying to all of them. ¡ Both Charlotte and Bryant are members of the National Honor Society. Charlotte pushes the group to get involved with a service learning project to help the boy she caught trying to steal and other’s from him school. They consider doing a project like an Angel Tree, but decide to create their own project. She and Colton devise a plan where the principal of the boy’s school compiles a list of the neediest students. Those kids will come to the mall to be given gifts by Santa (played by Colton) and his elf (played by Charlotte). The project turns out to be a huge success…and Charlotte and Colton finally get together. Bryant is brought to justice by the help of Colton’s camera phone and Brianna finally believes her best friend. Service Learning Projects ¡ Service Project – Raise funds for homeless or underprivileged kids or chose among the different links of ideas for projects and collaborate to come up with and execute a real service project that will benefit the community. 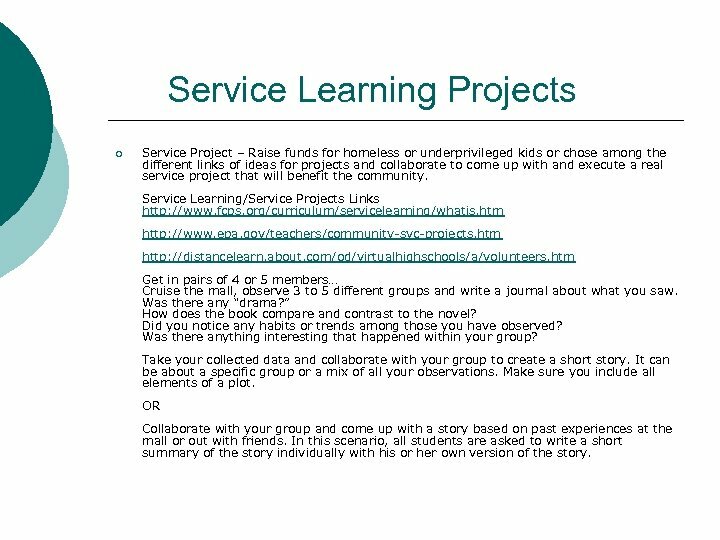 Service Learning/Service Projects Links http: //www. fcps. org/curriculum/servicelearning/whatis. htm http: //www. epa. gov/teachers/community-svc-projects. htm http: //distancelearn. about. com/od/virtualhighschools/a/volunteers. htm Get in pairs of 4 or 5 members… Cruise the mall, observe 3 to 5 different groups and write a journal about what you saw. Was there any “drama? ” How does the book compare and contrast to the novel? Did you notice any habits or trends among those you have observed? Was there anything interesting that happened within your group? Take your collected data and collaborate with your group to create a short story. It can be about a specific group or a mix of all your observations. Make sure you include all elements of a plot. OR Collaborate with your group and come up with a story based on past experiences at the mall or out with friends. In this scenario, all students are asked to write a short summary of the story individually with his or her own version of the story. 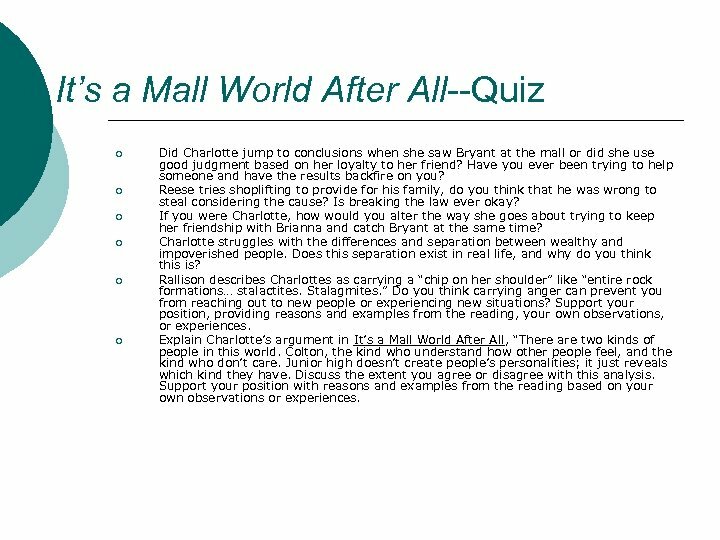 It’s a Mall World After All--Quiz ¡ ¡ ¡ Did Charlotte jump to conclusions when she saw Bryant at the mall or did she use good judgment based on her loyalty to her friend? Have you ever been trying to help someone and have the results backfire on you? Reese tries shoplifting to provide for his family, do you think that he was wrong to steal considering the cause? Is breaking the law ever okay? If you were Charlotte, how would you alter the way she goes about trying to keep her friendship with Brianna and catch Bryant at the same time? Charlotte struggles with the differences and separation between wealthy and impoverished people. Does this separation exist in real life, and why do you think this is? 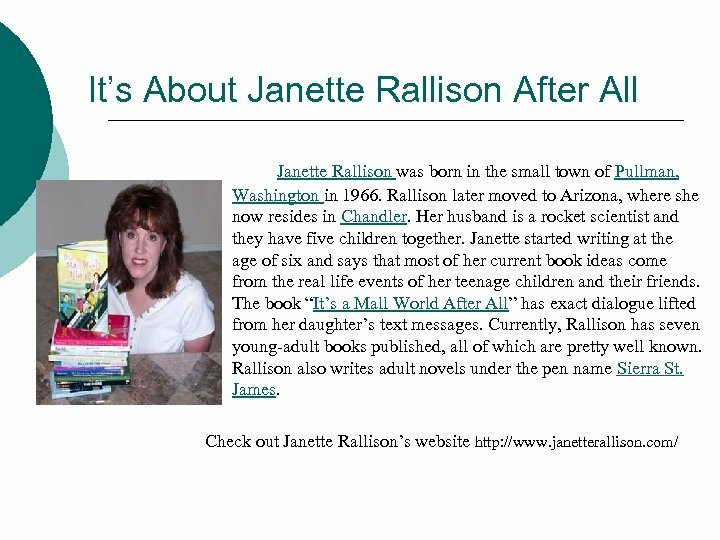 Rallison describes Charlottes as carrying a “chip on her shoulder” like “entire rock formations… stalactites. Stalagmites. ” Do you think carrying anger can prevent you from reaching out to new people or experiencing new situations? Support your position, providing reasons and examples from the reading, your own observations, or experiences. 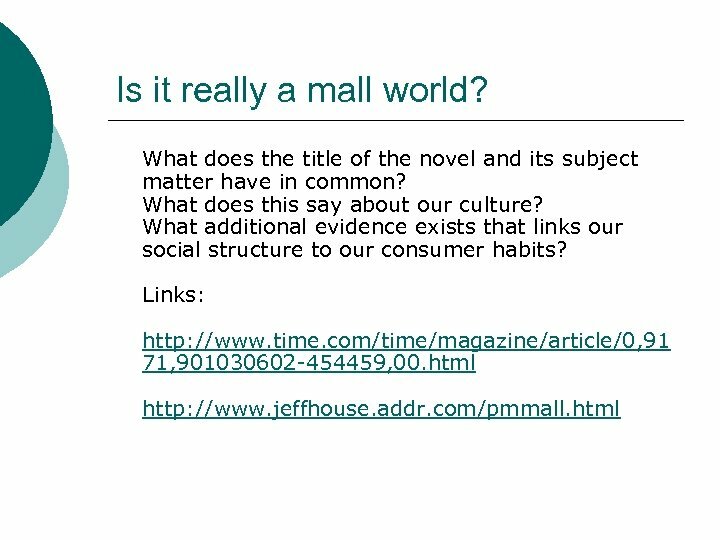 Explain Charlotte’s argument in It’s a Mall World After All, “There are two kinds of people in this world. Colton, the kind who understand how other people feel, and the kind who don’t care. Junior high doesn’t create people’s personalities; it just reveals which kind they have. Discuss the extent you agree or disagree with this analysis. Support your position with reasons and examples from the reading based on your own observations or experiences.